The above photo of the Roman Catholic Church on Woods Road in Solvay was taken, I think, soon after St. Cecilia's was finished in 1906. Until 1903 Solvay was part of the St. Patrick's parish in Syracuse. Then the Rev. 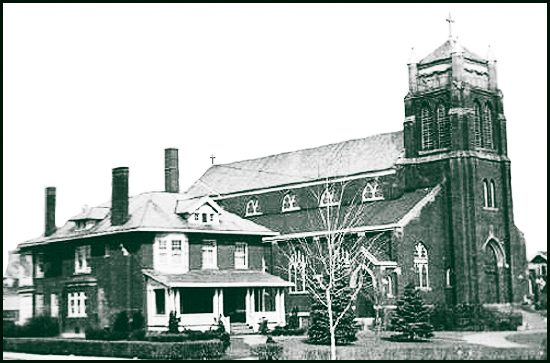 James F. Shea was assigned by the Syracuse diocese to create a separate parish for Solvay, and for several months masses were held in the old Town Hall on Milton Ave while Father Shea organized fund-raising events. A year later work was started on St. Cecilia's Church and by the end of that year the basement was finished and protected by what would become the church floor. That made it possible for Father Shea to say mass in the basement, which he did for the first time on Christmas Day in 1904. The building wasn't completely finished until December 1906, though I found several 1905 newspaper references to events at "the new St. Cecilia's Church." Cost of the church was less than $100,000. I saw one estimate of "about $80,000." This makes St. Cecilia's an incredible bargain, even by the cost of living standards of the early 20th century. It seemed a large church for what in 1906 was a tiny, but expanding village. It's a beautiful church that would be difficult to duplicate today. However, what I recall most was a small grotto in the basement, at the bottom of the steps to the side entrance on Second Street. It was an interesting, unexpected touch, and I'd often take a detour when I was leaving the church in order to visit to the grotto. St. Cecilia's holds several memories, though most of those memories are dusty because I left Solvay almost 50 years ago. Most of the events that took me back to St. Cecilia's since then were sad. But one of those sad events – the 1998 funeral of my aunt, Gertrude Maltby Smolinski – produced a light moment. The funeral mass was said by the Rev. James Mathews, who grew up nearby on Russet Lane, two houses from the Smolinski family. Father Mathews has his own parish in Syracuse, but celebrated the mass as a favor to the family. During his remarks he mentioned that he and the Smolinski brothers – Bimby, Bobby, Jim and Phil – had gotten together the night before to talk about old times. Among the things discussed – and mentioned at mass – was the Jit. My wife, a Presbyterian who grew up in Westchester County, still hasn't gotten over the Jit being cited during a funeral eulogy. Well, you'd have to be an old-time Russet Lane resident to understand. Father Shields was a master at flattering his congregation into being generous. When he wanted money for the school or another pet project, he'd mention how much another church had raised in a second collection the week before. Whether the figure was accurate or merely an instrument in a familiar Shields performance, I do not know. Nor do I know for sure he was telling the truth a week later when he praised his congregation for being so generous and exceeding the amount that had been raised by the other congregation, which we suddenly regarded as a rival in sort of a collection basket tournament. So there we were, all puffed up about ourselves. It felt good, so we'd do it again, next time. Or ... had we scrimped a bit when the special collection was taken the week before, well, we thought, we probably were the only ones. How else could the church have raised so much money? We'd make up for it, next time. Crafty fellow, that Father Shields. I was a young boy during the Father Shields era. Frankly, the man frightened me, because his low-key approach couldn't hide his dogged determination to realize a dream that might have been beyond the means of a blue collar congregation, most of whom were employed by a company that already had one foot out the door. But it was difficult to say no to Father Shields, a tall man, as I recall, who carried himself as though he were royalty. And in a way he was The King of St. Cecilia's. HIS ASSISTANTS were another matter. When Father Shields was pastor, he always had two assistant priests. For awhile one of them was Father Carl Denti, a gregarious, humorous man who came off as Eddie Haskell to Father Shields' Ward Cleaver. It was Father Denti who once staggered down the church steps, pretending he'd been hit when a single-shot fireworks rocket was set off after an August 15 mass. Today's sensibilities would likely prevent anyone, particularly a priest, from joking in that manner, but Father Denti's stunt was deemed harmless as well as funny. Some adults might have disapproved of his sense of humor, but Father Denti was much loved by the young people of Solvay. Where he won over adults – with my father as his number one fan – was in how fast he would whip through a mass. Where other priests might take up to 45 minutes on a low mass, Father Denti seldom exceeded a half-hour. Once, during a brief period that I attended several daily masses, Father Denti had us out the door in less than fifteen minutes. He was the reason that my father, the village mayor, made such an audacious suggestion when he met another priest, recently assigned to St. Cecilia's. "Nice meeting you, Father McCarthy," said my father. "Your masses run a bit long. Do you think you can shorten them?" MY FATHER thought Father Denti was the man for the job when he asked the priest to bless the Solvay village swimming pool at its opening in 1954. According to my father, Father Denti gave the task a great deal of thought, speculating (in jest, I'm sure) that if good enough, his would be adopted as the official church prayer to be used in the future at all blessings of swimming pools. In 2004, when St. Cecilia's celebrated its 100th anniversary, Monsignor Carl Denti made a point of attending. He had spent most of his priesthood elsewhere and was probably retired by 2004, though he remained in the area and would occasionally say mass back at St. Cecilia's. He died two years later, perhaps the most beloved priest in village history. As for Father Francis McCarthy, he remained at St. Cecilia's for several years, though he probably trimmed no more than a minute off his mass time. He was a soft-spoken man who had the unenviable job of teaching high school boys during the weekly hourlong classes that were held at the church. I'm sure this practice ceased many years ago, but in the 1940s and early '50s when I attended three Solvay public schools – Prospect, Intermediate and the high school – Catholic students were released from class once a week for the purpose of receiving Catholic instructions at the church. We'd march from the school to the church. After the instructions, our school day was over; at least, during the early years. If I recall correctly, as a high school student our instructions were scheduled about lunch time and afterward we returned to school to face the taunts of our non-Catholic friends. Non-Catholic parents may have objected to the way our public schools blended church and state, but I don't recall any controversy. There were, I think, two other Christian denominations with churches inside the village, but Solvay was overwhelmingly Roman Catholic. I never saw a percentage, but my guess would be at least 80 percent of village residents attended St. Cecilia's Church. UNTIL HIGH SCHOOL, all of my classes were conducted in the St. Cecilia's basement, which was curtained off into separate rooms, one for each grade. In charge were the nuns assigned to the church. The nuns lived in a house on Orchard Road, just around the corner from where I lived. We referred to the nun's home as "The Convent." About the time I left the village in the early 1960s, the nuns were relocated to a facility near the elementary school that had been built behind the church. "The Convent" was purchased by Julius Kulak, who had been a village trustee when my father was mayor. Kulak and his wife had several children, so the property was perfect for him. He also was deeply involved in the church and a few years later became a deacon. Today he is still with the church and is listed on the St. Cecilia's roster as the Rev. Mr. Julius Kulak, and more times than not is referred to by what I remember as his nickname, Jules. While I never had nightmares about them, the St. Cecilia nuns, as a group, were rather intimidating. I recall only a few names, none of which are of much help in any research I might attempt because all of them are names used by many nuns throughout the country. There must have been hundreds of nuns known as Sister Mary Margaret. The one I remember from St. Cecilia's was a tough, no-nonsense instructor. She never whacked me across the knuckles with a ruler, but I'll bet she did it to someone. The same for a nun known as Sister Mary Oliver, who could have been the long-lost sister of actor Edward G. Robinson. However, I've been lucky in life, and so it was that for three consecutive semesters I had as my religious instructor Sister Mary Arthur, who, had there been a movie made about the St. Cecilia nuns, would have been played by Ingrid Bergman (ah, remember her in "The Bells of St. Mary's"?). Sister Mary Arthur was a kind, gentle person who also was the youngest of the St. Cecilia nuns. For that matter, she was probably younger than any of the teachers at Solvay public schools. Certainly the most attractive. With Sister Mary Arthur in charge, studying the catechism was almost fun. FOR AWHILE I was a member of the boy's choir, which sang at the 11 o'clock mass, which may be the reason I soon quit. The 11 o'clock, as we called it, was a high mass, thus noticeably longer than the other Sunday masses. (Even Father Denti couldn't do much with a high mass.) My family preferred the 9:15, a low mass that never ran past 10 o'clock. The 9:15 was always packed. The church supposedly seats 810 people, but I'm sure more than 900 squeezed into the seats for the 9:15, with another 100 or so left standing in back, often through the vestibule and on the front steps. My uncle Billy Major had been an altar boy at St. Cecilia's in 1910 and my aunt Wanda (Smolinski) Kaldowski worked at the rectory. Wanda lived on Woods Road, a couple of houses from the church, which is why my father used to park in her driveway when we went to mass. That is, until Wanda's husband, Peter, decided he no longer was willing to have his driveway serve as a parking lot for church-going relatives. I don't recall what brought the matter to a head, but there was a lot of fire and brimstone that Sunday, all of it on the Kaldowski's front lawn. Twice a year I have flashbacks to the Sunday morning my family missed mass, despite our best intentions. Well, the word "best" isn't appropriate. The day certainly proved embarrassing, especially for my mother. For my father it was most inconvenient because the reason we missed mass also was the reason dinner was late that day (dinner being our Sunday afternoon meal). And Buster Major became grumpy when dinner was late. Anyway, the reason I have flashbacks twice a year is because that's how often we adjust our clocks for daylight saving time. One year, when we were supposed to spring forward, we fell backward; that is, we set our clocks back an hour when we were supposed to set them ahead. It's weird when I think about it now because we didn't lose an hour of sleep, as you do each spring. We actually gained two hours of sleep that day. Ah yes, going to confession. This was very much on my mind recently because the local PBS channel has been rerunning the charming British-Irish series, "Ballykissangel," in which the central figure, at least in the first season, is a young English priest assigned to a small Irish town. One particularly funny episode concerned the efforts of an over-enterprising businessman to install modern confessionals at the Ballykissangel church, St. Joseph's. These new confessionals, imported from Italy, are air conditioned and have electric sliding doors. The booths are further equipped so that it is possible to fax your confession to the priest and have him send a return fax containing your penance. You didn't have to be raised Catholic to see the humor in this episode. Back in the day – to borrow an expression that has become very popular – going to confession was a big deal. You couldn't receive communion on Sunday without going to confession the day before. This changed in the 1960s when suddenly one confession became a season ticket to the altar, provided the confessor felt he or she remained in a state of grace. Masses ... back in the day ... were several minutes shorter than they would become once large flocks of people regularly received communion. 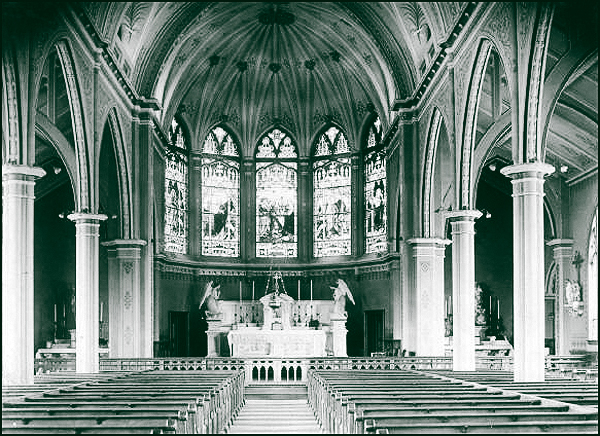 In the 1950s there were masses during which only a handful of parishioners left their seats. The possibility Father Denti just might do something like that was the reason I always said confession to Father McCarthy. Somehow I never worried that Father McCarthy would recognize my voice. I also assumed he'd listen politely and give me credit for being sincere, if not original, and would dispense a reasonable penance, like maybe five "Hail Marys." ONE OF MY favorite St. Cecilia memories was given new life in the 1992 Whoopi Goldberg movie, "Sister Act," when, as the bogus nun, she was put in charge of the church choir and taught them a hip, uptempo version of the hymn "Hail, Holy Queen" ("Salve Regina"). Often that's the hymn the St. Cecilia's choir sang as we left church after Mass. The final refrain goes, "Salve! Salve! Salve Regina!" But to me, and apparently many others, we heard it this way: "Solvay ... Solvay ... Solvay Regina!" Which is why that hymn always made me feel at home no matter where I heard it. And when I thought of home, naturally, I thought about St. Cecilia's Church.